Anti-violence organization asks coffee chain to go gun-free. In Virginia, you can still carry a loaded gun with your latte at Starbucks. At least for now that is. That’s because Starbucks requires all of its stores to obey all laws in the jurisdiction where it’s located. In Virginia, it means openly carried side arms are allowed. On Wednesday, the Brady Campaign to Prevent Gun Violence plans on fighting that rule. The organization will present a petition with 29,000 signatures to Starbucks executives asking them to make all of their stores "gun free." 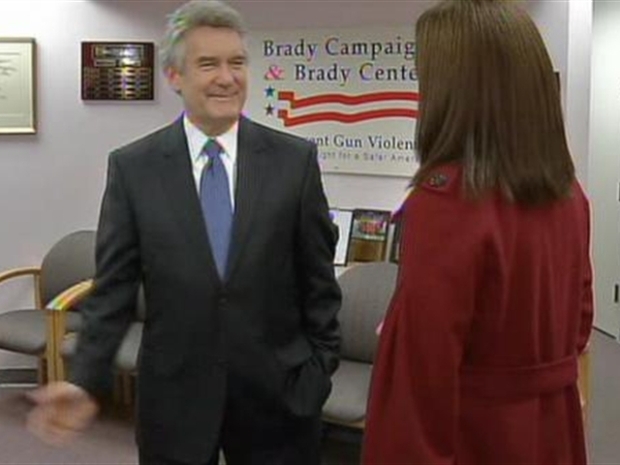 "Just as you can say if you're not wearing shoes you can't come in, if you're not wearing a shirt you can't come in, you can say if you're bringing a gun you can't come in," said Paul Helmke of the Brady Campaign. The anti-gun violence group founded by former presidential press secretary James Brady is about to take on Starbucks. The group will ask the company to change their policy on openly carried sidearms. Several establishments, including Pete's Coffee and California Pizza Kitchen, have already responded to the Brady Campaign's call. In a statement, Starbucks said it follows all state and local laws, and has its own safety measures in stores.